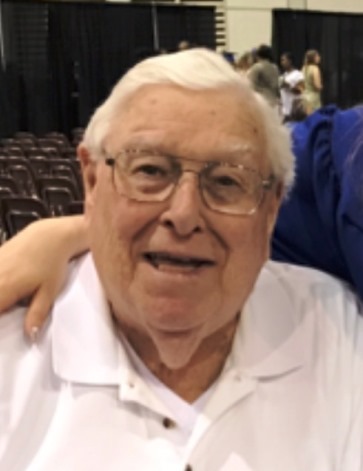 James E. Davis, age 88, of Marion, died peacefully on Friday, September 7, 2018, at home surrounded by his loving family. On April 12, 1930, Jim and his twin brother, Jack, were born in Price Hill/Cincinnati, Ohio, the only children of the late Leroy and Norma (Wherley) Davis. He graduated from Batavia High School in the Class of 1948, where he played catcher on the baseball team and trombone in the band. Following high school, Jim worked as a draftsman, at the William Powell Valve Company in Cincinnati, until he was drafted to serve in the U.S. Army in 1951. After basic training, he served overseas in Tokyo, Japan, where he was in the advisory group to the Japanese National Police Force, earning top secret security clearance. He was a veteran of the Korean War and was honorably discharged with the rank of corporal in 1953. After returning home from the war, Jim began working for the RCA Estate Range Company in Hamilton, Ohio, which was later purchased by the Whirlpool Corporation. In the late 1950’s, he was sent on a work assignment to the company’s research and engineering center in St. Joseph, Michigan, where a receptionist, Arliss Wells, kept catching his eye. Eventually, they began spending time together and the rest is history. They were married on March 5, 1960, in Stevensville, Michigan, and she would join him on his journey with Whirlpool to Marion, Ohio, in 1962. They shared over 54 wonderful years of marriage. She preceded him in death on October 22, 2014, after a year and a half battle with cancer. During Jim’s 37 years of service as an engineer with Whirlpool, earning six United States patents, he eventually worked his way up to being the director of the cooking products engineering department. He also led numerous management seminars for the corporation. He retired in 1990. Following his retirement, Jim and Arliss spent 22 magical years wintering in South Padre Island, where they made countless new friends, played cards, walked the beach, watched sunsets, loved eating out and taking trips to Mexico. Jim also enjoyed golfing, surf fishing, and deep sea fishing. Aside from raising his family, the years in South Padre were among the happiest of his life. Throughout his life, Jim had a weak spot for sports cars and boating. He also loved family vacations to St. Paul and Alexandria, Minnesota, Wales, North Dakota, and fishing trips to Canada. In his younger days, in the 1950’s, Jim was even a professional musician, playing string bass in the Clyde Phillips twelve piece orchestra and the five piece jazz group known as The Holidays. For the past few years, Jim has been a local fixture in many of the restaurants throughout Marion. He had a regular routine he stuck to, and everywhere he rarely had to order because the staff already knew what he wanted. A man of faith, Jim was a member of the Emanuel Lutheran Church, where he enjoyed attending chapel services on Thursday. He also was an active member and past president of the following organizations: Marion Industrial Club, Whirlpool Marion Division Management Club, Marion Toastmasters Club, Marion Midget Football Association, and the Villas of Hampton Woods Condo Association. He was a lifetime member of the VFW Post 7201 in Marion, past member of the Hamilton Ohio Sports Car Club, Marion Elks Club #32, and Marion County FOP #24. He also coached baseball for the River Valley Baseball for Youth program. Jim was a true gentleman in every sense of the word, and a natural leader of men. He demanded perfection from himself and everyone around him. Despite all of his many achievements, what he was most proud of was his family. They were his pride and joy. Left to cherish his memory are his three children: Sharon (Randy) Potts of Presque Isle, MI, Laura Detweiler of Marion, and James E. (Krista) Davis Jr. of Galena; five grandchildren: Steve Potts, Rick (Jennifer) Potts, Meredith Detweiler, and Andrew and Katie Davis; two great-grandchildren: Conner and Taylor Potts; his twin brother, Jack (Ruth) Davis; of Cincinnati. Services honoring Jim’s life will be observed at 1 p.m. on Friday, November 23, 2018, at Snyder Funeral Homes, DENZER Chapel, 360 E. Center St., Marion. Military honors provided by the Marion County United Veterans Council will follow at the funeral home. Friends and Family who wish to celebrate his life are invited to attend an open house from 2:00-6:00pm at the Hampton Woods clubhouse; 600 Hampton Woods Dr., Marion. Memorial contributions may be made to Heartland Hospice, 685 Delaware Ave, Marion, OH 43302. On behalf of Jim’s family, they would like to extend a heartfelt “thank you” to Angie, Tracy, Andrea, and all of the special Heartland Hospice angels, who tenderly cared for Jim during his final months and weeks. Also, “thank you” to all of the wonderful servers at the restaurants he frequented for always doting over him. Snyder Funeral Homes of Marion are honored to serve Jim’s family and your favorite memories and condolences may be shared with them via www.SnyderFuneralHomes.com.